Big Brother is a striking novel about siblings, marriage, and obesity from Lionel Shriver, the acclaimed author the international bestseller We Need to Talk About Kevin. For Pandora, cooking is a form of love. Alas, her husband, Fletcher, a self-employed high-end cabinetmaker, now spurns the “toxic” dishes that he’d savored through their courtship, and spends hours each day to manic cycling. Then, when Pandora picks up her older brother Edison at the airport, she doesn’t recognize him. In the years since they’ve seen one another, the once slim, hip New York jazz pianist has gained hundreds of pounds. What happened? 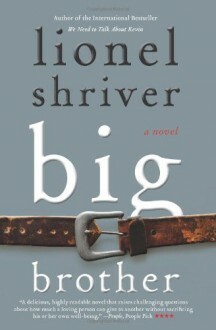 After Edison has more than overstayed his welcome, Fletcher delivers his wife an ultimatum: It’s him or me.Rich with Shriver’s distinctive wit and ferocious energy, Big Brother is about fat: an issue both social and excruciatingly personal. It asks just how much sacrifice we'll make to save single members of our families, and whether it's ever possible to save loved ones from themselves.